Take a gander at the newest BMW M3 fighter on the block. The new C63 takes after the recently unveiled Mercedes-AMG GT in several interesting ways, including its new title as a Mercedes-AMG product, the hand-built twin-turbocharged 4.0-liter V8 that propels both vehicles, and the addition of an “S” trim level to the C63 model lineup, which boosts handling and performance features even further than the standard C63. Weighing in at 3615 pounds, the standard C63’s V8 will output 469 horsepower and 479 pound-feet of torque, sending the sports sedan to 62 mph from rest in 4.0 seconds, while the C63 S gets 503 hp and 516 lb-ft from the same motor in a different state of tune, and cuts the sprint to 62 mph down to 3.9 seconds. Both cars will electronically limited to a 155 mph top speed. Gears will be managed via a seven-speed AMG Speedshift dual clutch transmission and power will be routed exclusively to the rear wheels. Much like the GT, the C63 can also be equipped with dynamic engine mounts which - in a manner similar to adaptive dampers - are designed to address the conflict of interest between comfort and handling. The dynamic engine mounts are said to adapt their stiffness on the fly based on driving conditions and style, reducing vibration from the engine and transmission during normal motoring or bringing in additional stiffness and dynamics during more spirited driving sessions. The system comes fitted as standard on the C63 S.
A choice of two new performance exhausts will also available. The standard exhaust system features a dynamically-controlled exhaust flap which can vary the engine noise from “low key” for long drives to “raw emotionality” depending on what mode is set in the AMG Dynamic Select driving mode. The second, optional exhaust system allows the engine sing at three separate, user-selectable volumes by way of three electronically controlled exhaust flaps, which are controlled independently from the drive mode selected by a button on the center console. Both the C63 and C63 S are expected to make landfall in the United States in March of 2015, with a special “Edition 1” package along for the ride. The Edition 1 package will include unique forged wheels, sport stripes, gloss black exterior moldings, black Nappa leather with diamond cross stitching, and other unique visual elements. Pricing is expected closer to launch. Check out the press release below for additional details on the new C63 and C63 S, and be sure to keep an eye on the 2015 Mercedes-AMG C63 overview page for updates as we have them. Pure fascination and breathtaking dynamics – the new Mercedes-AMG C63 sets benchmarks. The high-tech drivetrain, the signature AMG handling and the high level of individuality in optional equipment guarantee an utterly unique driving experience. The pinnacle of the C-Class line-up is driven by an all new 4.0-liter V8 biturbo engine closely related to the power unit that provides breathtaking propulsion in the new Mercedes-AMG GT. The power spectrum ranges from 469 hp in the C63 to 503 hp in the C63 S. With an unrivalled fuel fuel economy, the C63 is the most fuel-efficient eight-cylinder car in the high-performance segment. The extensive range of standard equipment includes the AMG Adaptive sports suspension with electronically controlled shock absorbers, the mechanical rear locking differential and the AMG DYNAMIC SELECT with its multiple drive programs. Additionally, there will be a highly exclusive "Edition 1" model available from market launch. Dynamics plus long-distance comfort –the new Mercedes-AMG C63 offers impressive engine output with exceptionally low fuel consumption figures, outstanding longitudinal and lateral dynamics and yet delivers a high level of everyday usability. As form is just as important as function, the interior and exterior design is more distinctive than ever before. The V8 pinnacle in the C-Class portfoilio is available in a choice of two models –the Mercedes-AMG C63 S and C63, with the C63 S set up for even more dynamic handling and performance. The Mercedes-AMG C63 celebrates its world premiere on October 2, 2014 together with the show premiere of the Mercedes-AMG GT at the Salon de l'Automobile in Paris. Market introduction in the USA begins in March 2015 with both the C63 and C63 S launching at the same time. "We are also marking the beginning of a new era with the new nomenclature. The successor to the Mercedes-Benz C63 AMG, which has been incredibly successful worldwide, will now be called the Mercedes-AMG C63," says Tobias Moers, CEO of Mercedes-AMG GmbH. "At 40,000 units, the 204 C63 AMG was the bestselling AMG model. We will now add to this success with the new Mercedes-AMG C63. Be it in drive, handling or equipment, the Mercedes-AMG C63 sets new benchmarks and will further strengthen our brand promise 'Driving Performance'. AMG customers can look forward to an exceptionally dynamic driving experience." The C63 is at the forefront of the competitive field. The new high-performance vehicles from Affalterbach are the only ones in the segment to be equipped with an eight-cylinder biturbo engine. The result is impressive power delivery and a highly emotional engine sound – a signature of the AMG brand. Drivers benefit from unrivalled performance delivered by a supreme level of power and torque. The C63 S accelerates from zero to 60mph in 3.9 seconds and the C63 in 4.0. The top speed is 155mph (electronically limited). "Naturally, the new Mercedes-AMG C63 is once again powered by an eight- cylinder engine. The passionate power delivery and highly emotional sound of our 4.0-liter V8 biturbo are truly compelling. At the same time, we are maintaining our leading role in the core issue of efficiency. No other high- performance V8 automobile is more fuel efficient than the new C63,"
says Christian Enderle, Head of Development Engine and Drivetrain at Mercedes-AMG GmbH. The C63 not only holds the top position in terms of engine data and performance, it also sets new benchmarks in fuel consumption. The high-performance car from Affalterbach demonstrates exceptional efficiency that puts it at the top of the segment. And it does not stop there – the C63 is the most fuel-efficient eight- cylinder, high-performance vehicle in the world. It achieves a remarkable decrease in fuel consumption compared with the preceding C63 AMG. The new Mercedes-AMG C63 consumes around 32 percent less fuel than its direct predecessor with the 6.3-liter V8 naturally aspirated engine – while delivering even more performance and the emotional sound that is a signature of the AMG V8. This impressive efficiency improvement is rooted in the new drive package. The M177 4.0-liter V8 biturbo engine is a close relative of the M178, which is the sports-car heart of the new Mercedes-AMG GT. The innovative eight- cylinder is notable for its outstanding power delivery, targeted lightweight design, high efficiency and environmental compatibility. It also fulfills the highest standards in terms of noise and vibration comfort. The newly developed eight-cylinder features biturbocharging, whereby the two chargers are not located on the outside of the cylinder banks, but instead, within the cylinder V – specialists refer to this as the "hot inside V". The resulting benefits are a compact engine design, optimum responsiveness and low exhaust emissions. Mixture preparation is handled by the petrol piezo direct injection system used exclusively by Mercedes. The third generation of the spray-guided combustion process has been developed to meet all future legislative requirements. A sophisticated engine cooling system ensures high performance even at ambitious race-track speeds. Fascination, emotionality and immediate recognition – engine sound is an important development objective. The C63 and C63 S feature a sports exhaust system with a dynamic electronically controlled exhaust flap. Depending on the AMG DYNAMIC SELECT drive program, the engine sound varies between low-key for long-distance travel and raw emotionality. The exhaust flap is located in the front third, at the interface between the two pipes. Its infinitely variable actuation is controlled on the basis of the drive program, the performance wishes of the driver and the engine speed. A Performance exhaust system with three electronically controlled exhaust flaps is available as an option for both engine variants. It provides the driver with an even greater level of control of the exhaust note via a button on the center console. In the "Comfort" drive program, the engine is quieter and more comfortable, while, in "Sport +" and "Race", the V8 sound is even more dominant and evocative of a race touring car – complete with acoustic up-shift and distinctive double de-clutching feedback. In addition to setting it via the drive programme, the engine sound can also be set individually at any time at the push of a button. A further new feature of the C63 S that is unique in the competitive field is the dynamic engine mounts – as used on the Mercedes-AMG GT. They address the conflict of interest between comfort and handling by reducing vibration from the engine/transmission unit. The dynamic mounts can adapt their stiffness smoothly and in fractions of a second to the prevailing driving conditions and style. Soft engine mounts improve comfort by better reducing noise and vibration. Handling and agility, on the other hand, benefit from slightly stiffer mounts. When driving dynamically, the driver feels more closely connected to the vehicle as a result of increased feedback, while steering response is more direct. The driver benefits overall from a more precise driving feel. Minimized movement of the drivetrain mass calls for less correction on turn-in. Engine production by hand – "one man, one engine"
"one man, one engine" principle. A large part of the direct and sporty character of the new Mercedes-AMG C63 is attributable to the transmission. The AMG SPEEDSHIFT MCT 7-speed sport transmission offers a compelling mix of tailor-made dynamics and exceptional variability. The MCT transmission was extensively redeveloped for application in the C63 and is now even faster in its reaction times. Be it automatic or triggered at the steering wheel paddle by the driver, a manual up or down-shift is now noticeably faster than in the last model. The transmission is now significantly more spontaneous in the "Sport +" and manual modes in particular. This increase in responsiveness was enabled by optimization of the transmission's hardware and software. Also, the aluminium shift paddles on the Performance steering wheel are now able to transmit the driver's shift inputs even faster than before, thus further increasing the dynamic feel. One look at the drive programmes shows the high variability of the AMG SPEEDSHIFT MCT 7-speed sport transmission. The available choices are "Controlled Efficiency", "Sport" and "Sport +" – as well as "Race", which is exclusive to the C63 S. The driver chooses from the various drive programmes with the aid of the AMG DYNAMIC SELECT switch. The "temporary M" function, activated by using the paddles, delivers a further increase in dynamics in any mode. Fascinating agility, high cornering speeds and optimum neutrality – the C63 is equipped with independent suspension featuring a high proportion of aluminium, dynamic-oriented kinematics, electronically controlled shock absorbers and AMG-specific elastokinematics. With the AMG Dynamic sport suspension, the customer can vary characteristics in three stages between maximum sporting performance and good long-distance comfort. 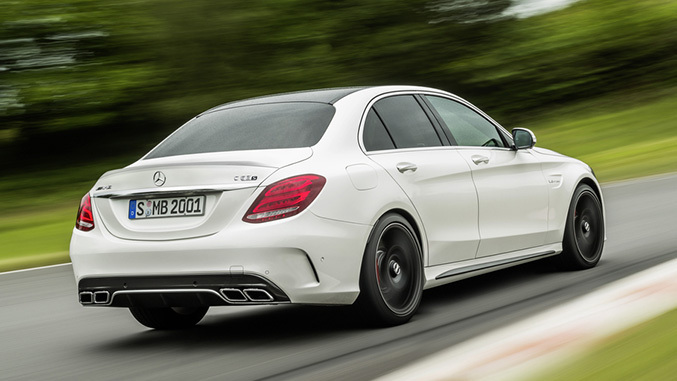 At the front of the C63 is a four-link front suspension with motorsport-based radially mounted brakes. Independent steering knuckles and a wider track permit higher lateral acceleration. The multilink rear suspension with independent wheel mounts likewise has a higher negative camber. To improve traction and dynamics, the C63 has a mechanical locking differential at the rear, while the C63 S is equipped with an electronic rear locking differential. Both locking differentials reduce slip at the inside wheel without braking input. As a result, the driver can accelerate sooner out of corners and the car maintains its stability when braking at high speed. The locking differential also improves traction when accelerating from a standstill. Compared with the mechanical solution, the benefits of the electronic locking rear differential, which is standard equipment on the C63 S, are its faster and more finely tuned control, thus pushing the physical limits of the driving envelope even higher. The standard 3-stage ESP® with the functions "ESP ON", "SPORT Handling Mode" and "ESP OFF" is perfectly networked with the locking rear differential and expertly tuned to the high level of dynamics. The electromechanical speed-sensitive sport steering ensures precise and agile handling, with the driver benefitting from a direct ratio and optimized response characteristics. It also has variable power assistance, whereby the steering force is adapted relative to the current vehicle speed. The power assistance reacts not only in accordance with vehicle speed, but also in line with current lateral acceleration and the drive programme chosen via AMG DYNAMIC SELECT. The C63 runs as standard on titanium grey painted and polished alloy wheels measuring 8.5 x 18 (front) and 9.5 x 18 (rear) in 10-spoke design and clad in 245/40 R 18 tires (front) and 265/40 R 18 (rear). The tire dimensions on the C63 S are 245/35 R 19 (front) and 265/35 R 19 (rear) running on alloy wheels measuring 8.5 x 19 (front) and 9.5 x 19 (rear) in 5-twin-spoke design, painted in titanium grey and polished. A high-performance, ceramic-composite brake system is available for the first time as optional equipment for the C63 S. Optional sport cup tires ensure a noticeable and measurable increase in grip. The driver can use four different AMG DYNAMIC SELECT drive programmes to influence the characteristics of the C63. The C63 S has the additional "Race" programme, which enables a maximum level of individualisation. The driver defines the driving experience using a switch to the left of the touchpad. There is a choice of several different pre-configured driving programmes and an "Individual" drive programme, which allows extensive self-configuration. "Controlled Efficiency" is the balanced drive programme with a comfortable suspension and steering set-up as well as fuel-optimized drivetrain settings – including soft gearshifts and a more restrained engine sound. The "Gliding Function" is completely new and delivers a further reduction in fuel consumption. If the driver lifts off the accelerator between37 and 99 mph - , the clutch of the MCT transmission opens and the engine is decoupled from the drivetrain. The electronics system reduces the engine revs to idle, and the resistance generated by the compression and frictional forces produced under trailing throttle are reduced. The "Sport" and "Sport +" drive programmes increase sporting intensity. "Race" is reserved exclusively for the C63 S and is the optimum setting for ambitious laps on a closed race track. Form follows performance – the design of the powerful V8 top model is influenced by motorsport and reflects its fascinating technology. Sensual clarity combines with stylish sporting character – the Mercedes C63 inspires fascination from the very first glance. From a visual standpoint, the new model is clearly a member of the Mercedes-AMG family. The exteriors of the C63 and C63 S are differentiated by specific design elements. The emotional, sensual surface design of the new C-Class, with its reduced, minimalist forms, now has an added, positive tension that gives it a truly dynamic character. The wider track and powerful eight-cylinder call for a completely standalone front end. The Mercedes-AMG C63 has aluminium front fenders, widened on each side by 0.55" and bearing "V8 BITURBO" lettering. The entire front end has also been lengthened by 2.12". In addition, the structure of the body-in-white has been reinforced in specific areas in order to compensate for the extreme longitudinal and transverse forces generated and transmitted by the drivetrain and running gear. Mercedes-AMG sets clear accents in sporting character, expressed succinctly at the front end – gracing the long aluminium bonnet are two distinctive power domes. Together with the wider front fenders, they guarantee a particularly muscular look. Positioned low down and with a characteristic arrow form, the "twin blade" radiator grille with AMG lettering lowers the vehicle's visual center of gravity. The "A-wing" takes a three-dimensional form and also serves as an airflow guide for the three cooling air intakes. Flics ensure optimum airflow to the cooling module. Along the lower edge of the front skirt, a front splitter helps to increase downforce. At the rear end, the diffuser insert with three fins is a feature carried over from motorsport, as are the visual air outlets positioned on either side. They generate defined air separation edges and improve the cd figure. The two chrome-plated twin end pipes of the AMG sport exhaust system are perfectly integrated into the diffuser. The C63 Sedan has a separation edge on the rear deck lid,–which ensures even better grip at the rear axle. Every detail in the interior of the C63 contributes to a stunning overall effect. The careful choice of select, first-class materials, their sumptuous tactile qualities and their precision craftsmanship deliver a sense of quality that is seldom seen even in higher vehicle classes. Like the exterior, the more powerful C63 S is distinguished from the C63 on the inside by a number of design details. The dashboard is finished in black ARTICO man-made leather, with the premium look-and-feel further enhanced by stitching in crystal grey, the wing- like trim element in aluminium and the AMG-exclusive, IWC-design analogue clock (depending on equipment choice). Next to the touchpad is the AMG DYNAMIC SELECT switch as well as a number of AMG-specific controls, such as the button for the 3-stage AMG Dynamic sport suspension, the 3-stage ESP® and the optional button for the Performance exhaust system with variable exhaust flap control. The instrument cluster and the 3-spoke Performance steering wheel with 12-o'clock mark deliver a dynamically sporty ambience. Equipped with dedicated carbon weave-pattern dials and signature AMG numerals. Performance seats are also available as an alternative to the standard sports seats in MB-Tex / DINAMICA microfibre. They give occupants a lower seating position and ensure increased lateral grip due to their more powerfully contoured form. A range of further optional equipment means the Mercedes-AMG C63 can be extensively tailored to individual preferences. Exclusive and irresistible – the C63 "Edition 1"
The stated aim of Mercedes-Benz is to make the highest level of safety available to all. For this reason, the C-Class features many of the new and extensively enhanced assistance systems that celebrated their world premieres just a few months ago in the S and E-Class. Standard equipment on-board the C63 includes enhanced drowsiness warning system ATTENTION ASSIST and COLLISION PREVENTION ASSIST PLUS, which helps to avoid rear-end collisions. The assistance systems increase both comfort and safety. Mercedes-Benz calls this "Intelligent Drive". The predecessor to the new C-Class already demonstrated impressive results in terms of passive safety. The new model exceeds these and sets new benchmarks. What's Really Driving Your Car?